This week, fire crews in West Texas are continuing to respond multiple fires in Jeff Davis County. The Scenic Loop Complex Fire — a group of 6 individual fires — is burning near the northern part of Highway 166 and has affected a total of roughly 7,500 acres in the area. 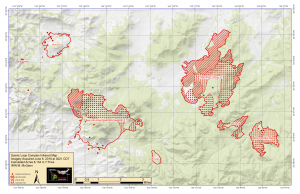 The fires began June 3, when a lightning storm sparked 18 fires in the Davis Mountains area. But since then, six continue to burn. 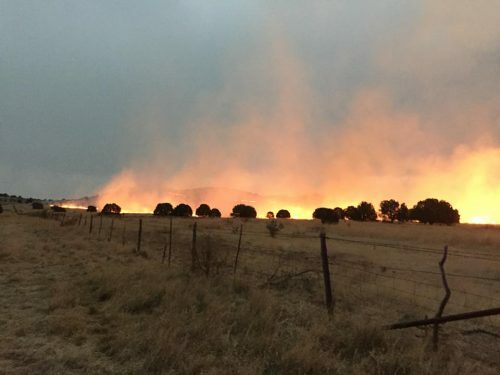 The Windmill fire has currently affected 1,000 acres in the Davis Mountains area. The 48 Tank fire has also spread across 1,000 acres. Both of these fires are burning in the Texas Nature Conservancy. Additionally, the Long X 2 fire is burning through dry brush and grass. It’s burned through 2,000 acres. By Tuesday night, Bear Mountain fire had spread across 2,000 acres in Jeff Davis County. The Jones-Phillips fire is at 1,500 acres. The smallest fire — the Brooks fire — has spread through 150 acres and, as of Wednesday morning, is 75 percent contained. There are roughly 120 responders on the ground, including local crews from Fort Davis, Valentine and Cherry Creek. There’s also a type-2 incident management team with the Texas Forest Service in place. By Thursday, officials expect a federal team to assist with the blazes. In early May, a federal response team came to West Texas to assist with the McDannald Ranch fire, which burned through some 20,000 acres. Officials say the priority on Wednesday will be a “burnout operation” on the 48 Tank fire. This includes removing the dry shrub and grass — “fuels” — in the area. Since Monday, there have been airborne efforts to contain the fires. There is heavy traffic in the area due to the large number of fire trucks and responders on the road. This entry was posted in KRTS News, KXWT News and tagged Fort Davis, Scenic Loop Complex fire. Bookmark the permalink.